ILTA's 2017 Technology Survey Now Available! ILTA's most prestigious publication each year is our annual Technology Survey, and is recognized as the authoritative report on current and trending technologies and best practices used in law firms. It provides substantive data against which you can benchmark your organization's technology implementations and future plans. This year we had our largest participation ever, organization participation increased to 46 percent, with a total of 579 firms responding this year - 139 more than last year! We know you'll benefit from a review of the full analysis, and it is reasonably priced at $500 (member rate). The 2017 survey included insight from over 570 organizations representing more than 123,000 attorneys and 250,000 total users. This report is published as a PDF optimized for viewing on-screen. 2018 will be a very interesting year, with new products in AI and security and a significant move of IT resources to the cloud. Learn more about these highlights from the survey. 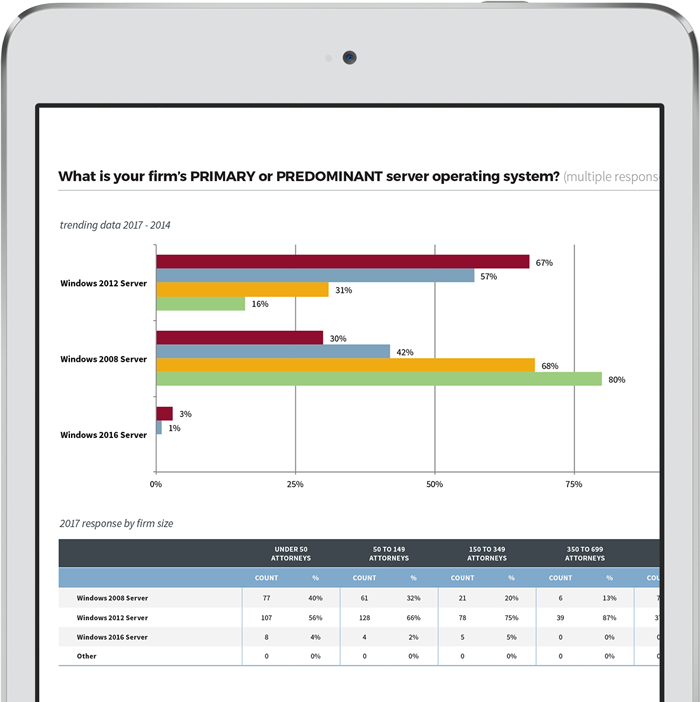 Member Survey Participants: If your organization participated in the survey, you get full access for FREE. Premium 2017 Members: 2017 ILTA Premium Membership - Your organization already pre-paid the 2017 survey. Platinum Business Partners: As an ILTA Platinum sponsor in 2017, a FREE copy was sent to the company's primary contact. Add the survey to your shopping cart, and the appropriate discounts or your FREE copy will be automatically applied or added AT THE END of the checkout process. Already purchased the survey and need to re-download the PDF? Questions about the Tech Survey?